Thanks for your interest in my romantic HERITAGE LOG CABIN....2 bedrooms, 2 bathrooms, 1100 SF located right in town. Delight in the nostalgia of old world charm of hand-cut log & chink walls, rustic stone fireplace, original wide plank wood floors, rough-cut cedar & log ceilings, covered rocking chair front porch with gas grill…. blended with the modern comforts of central heat & air, gas log fireplace, Jacuzzi bath tub, stainless kitchen appliances, plus the added luxury of a six person hot tub (always fresh water), outdoor fire pit, awesome massage chair, 50 inch HDTV & DVD player, HDTVs/DVDs in both bedrooms, high speed wireless Internet, ultra plush King and Queen beds (plus a twin airbed), exquisite furniture and décor. Even though in-town, it’s the nostalgia of country living where you’ll hear a rooster crow in the distance. Davy Crockett never had it so good! With all the special touches, the Heritage Log Cabin feels like a warm inviting home rather than a 'vacation rental house.' I am available anytime to see to your needs. I make sure the home is exceptionally clean, well-maintained & the hot tub sparkling with fresh water. As you enter the 3 inch solid wood antique door with iron door ringer, you’ll immediately feel the warmth and charm of a by-gone era. You’ll be enchanted by the stacked log and chink walls, the wide plank wood floors, the original wagon wheel ceiling light fixture, and the large stone fireplace that we’ve enhanced with warm ambient lighting and easy-to-use remote controlled gas logs. You are sure to appreciate the exquisite love seat and matching sofa, unique wall art and antique beaded lamp. Relax while you watch the 50 inch Plasma HDTV with DVD player. In front of the large picture windows is a dining table and chairs where you can enjoy a meal or play one of the many board games provided. There’s even an awesome massage chair for a great back massage and a cabinet full of kids toys, books and stuffed animals. The romantic master bedroom suite is luxuriously appointed with a gorgeous carved four poster king bed with a sumptuous quality mattress, soft bed linens and elegant comforter. The 32 inch HDTV has a built-in DVD player and a big selection of DVD movies. Your private bath with original log walls has a walk-in shower, furniture vanity sink, cathedral ceiling complete with a crystal chandelier and elegant artwork. In the back there is a full size washer and dryer for your convenience. The cozy second bedroom has the warm charm of log walls decorated with a touch of whimsy. Be enchanted by the colorful red comforter on the plush queen bed, sumptuous bedding and the unexpected jeweled artwork. Suspended in a corner is a flat screen HDTV. The small closet is supplemented by an antique wardrobe closet with full length mirror. Your private bathroom has a deep Jacuzzi jetted bath tub, furniture vanity sink and log walls. For the additional guest, we have a quality quick inflate-deflate twin air bed. You’ll delight in the kitchen with authentic solid wood cabinets, antique brick-like wall covering and wide-plank floors with new counter top, granite sink and upscale stainless appliances including a refrigerator, oven with smooth cook top, microwave and dishwasher. Serve your meals on festive hand-painted dishes. There are top quality pots, pans, bake dishes, bowls, cooking knives, coffeemaker and grinder, blender, crock pot, toaster, hand mixer, and much more. For infants, we have a small crib with bedding, Pack-N-Play, stroller and high chair. Kids love the stuffed animals, games and books we provide. Outside is a delightful playground with slide, swings, fort and climbing wall for their entertainment. Enjoy your covered front porch with a suspended swing for two and a colorful red-cushioned antique bamboo sofa and tables. At the end of the porch is a propane gas grill for those delicious barbequed meals. In the yard, kids will have hours of fun playing on the PlayNation playground fort, slide, swings and climbing wall. Roast marshmallows over the firepit. The yard is fully fenced. There is a large 6 person hot tub in a fenced covered area and just beyond that is a lawn with fruit trees and circular driveway. LOCATION: Just a mile from I-26 exit 49A and Hwy 64, this vacation rental is located in Hendersonville, NC. The HERITAGE LOG CABIN is fully-fenced lot in a small residential neighborhood with less than a mile to a large shopping and restaurant complex including a Super Walmart. This convenient location is just a few minutes from downtown Historic Hendersonville Main Street shops, galleries and restaurants. It’s a quick 24 minutes to downtown Asheville and the Biltmore Estate. 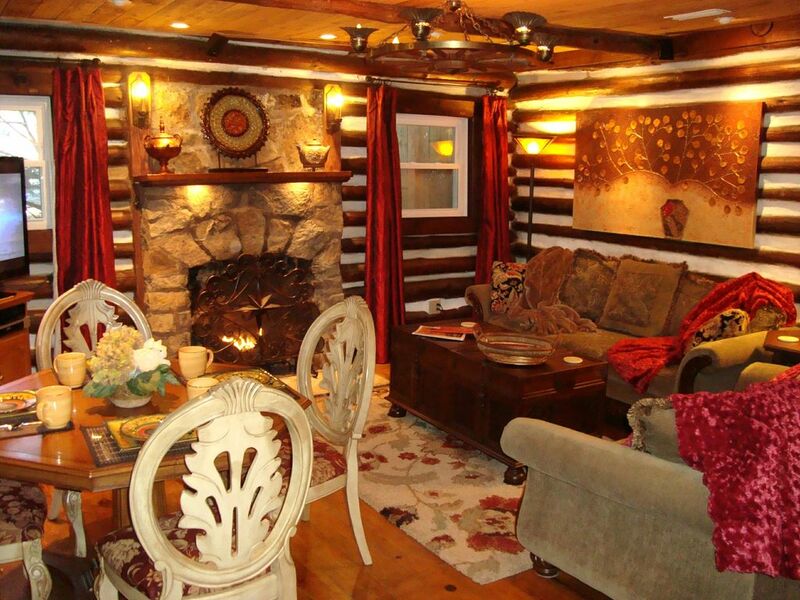 YOU ARE INVITED to experience the joy of staying in an authentic log cabin. This charming historic log cabin, while retaining its authentic rustic charm, has been lovingly restored with all new wiring, plumbing, ambient lighting, central heat & air conditioning and all new bathrooms. You have the best of the old and the new! YOU DESERVE TO BE SPOILED!!! With all the special touches, this is a warm inviting home rather than a “vacation rental house.” I promise you a meticulously clean & well-maintained home thoughtfully furnished with your every need in mind! I am a caring local owner who takes exquisite care of my 11 AshevilleVacationHomes properties and am available anytime to see to your needs. YOU are my full-time business! You may verify listing authenticity by doing an Internet search under the name “HERITAGE LOG CABIN” in the Asheville NC area to locate my independent listing. I am passionate about living in these awesome Blue Ridge Mountains of Western North Carolina and adore sharing my vacation rental homes with guests who come to experience our area’s mountains & towns. I take exquisite care of my properties and am available anytime to see to your needs. I make sure each home is exceptionally clean, meticulously well-maintained and the hot tub sparkling with fresh water. I have lived in Asheville, North Carolina for many years and find great joy in discovering more and more reasons why this is the BEST PLACE IN THE WORLD TO LIVE! Asheville is consistently in the “Top 10 Places To Live” according to almost any criterion published! It’s a diverse multi-cultural blend of mountain folk and cosmopolitan society set in a dramatically beautiful mountain setting. It is my heart-felt desire to provide gorgeous welcoming homes in spectacular settings and to share this town with you! With all the special touches, I promise you that my vacation rental homes will feel as though you are staying at a friend’s warm inviting home rather than a 'vacation rental house.' You'll appreciate the tasteful decor and thoughtful care my homes reflect. Each home has been lovingly remodeled, elegantly furnished, beautifully decorated and thoughtfully accessorized with special amenities to pamper you including massage chairs, hot tubs, high speed wireless Internet, king beds with sumptuous bedding, HDTV’s & DVD's, movie libraries, quality well-equipped kitchens, fireplaces, central heat & air conditioning, washers & dryers and much more! Unique to my homes are all the amenities offered for babies and children. There are cribs, pack-n-plays, strollers, high chairs, baby bath tubs, stuffed animals & blankies. Older children love to play on the outdoor playgrounds with forts, slides, swings, climbing walls, etc. plus games, books, toys, kids DVD movies and more. Kids of all ages love to roast marshmallow at the firepits. My homes are easily accessed, right in-town, close to grocery stores, restaurants and shopping. No winding mountain roads to get lost in or long drives to town. The homes are in peaceful, lush vacation spots where you can relax and feel at home. Rather than dealing with a third party management company with limited business hours & knowledge of a home, you can deal directly with me, the owner. I am available to you 7 days-a-week, anytime between 9 AM and 7 PM and after hours for emergencies. I know my properties intimately because I have personally had them restored, remodeled, furnished and equipped. YOU are my full time business! Because I live locally, I am available whenever you call. Email me for my web address to see all 11 of my vacation homes. Take a virtual tour at AshevilleVacationHomes. toilet, combination tub/shower, jetted tub, Jacuzzi jetted bath tub with lots of jets! Both Bathrooms have been completely remodeled for safety and updating yet retaining the original log wall & chink charm. All new flooring, plumbing, electric, fixtures, etc. The cabin is at 2200 feet above sea level in a mountain valley of the Blue Ridge Mountains. The home is 3 miles to Hendersonville's historic Main Street w/10 blocks plus side streets of wonderful restaurants, galleries, antique stores and unique shops. It is 1 mile from a large shopping complex of shops & restaurants. Central air is available even though evenings in the mountains are often cool. Top quality high count cotton sheets, lush comforters and plenty of soft towels are provided. Stainless quality appliances. Top quality cookware & utensils, cooking knives, coffee maker & coffee grinder, crock pot, toaster, waffle iron, blender, hand mixer & much more! 50' HDTV in the living room & DVD player. The bedrooms each have an HDTV. Reception is through cable company. Big DVD movie library for your pleasure. Private, Large 6 person hot tub with plenty of jets! Always filled with fresh, clean water for your arrival! Massage Chair - state of the art 'Hands on Technology'; Hot Tub for 6; Jacuzzi Jetted Bath Tub; Ultra-Luxury Mattresses; Twin Air Bed with Quick Inflate/Deflate Built-in Motor; Gas Log Fireplace with Remote Control; High Count Cotton Sheets; Ultra Plush Blankets; Plenty of Bath Towels; Free High Speed Internet Connection; 3 Cable HDTVs, DVD Player; Big DVD Movie Library; Free Phone; Vacuum & Cleaning Supplies; Board Games; Firepit; CHILDREN: Crib; Pack N Play; High Chair; Stroller; Stuffed Animals, Toys, Games, Blankies, Books; KITCHEN: Complete Quality Cookware & Utensils; Full Size Stainless Appliances; Disposal; Hand-Painted Plates; Quality Silverware; Glassware; Hand Mixer; Sharp Knives; Crock Pot. This is the Best home rental experience we’ve had yet! The house was super cozy with comfortable beds, old style cabin atmosphere with all of the modern conveniences. We loved how it was centrally located yet had plenty of privacy. We would highly recommend this as a perfect get away spot! We enjoyed our stay - the hot tub was a huge hit with the teenagers and the location was perfect. The house was clean and we ended up watching a couple of the movies they had available. It was great to have a washer and dryer and the gas fire place was lovely. It’s a very well stocked 2 bedroom log cabin. I had accidentally brought whole bean coffee and there was actually a coffee grinder there! I could not believe it. It is very easy to get to the cabin. It is really close to town. We used the hot tub, fire pit and playground. The massage chair was also a hit. The cabin was all that I could have asked for. Any issues that popped up were quickly dealt with. The place was beautiful, relaxing and quite a few unexpected amenities. It was located very close to any shopping needs yet far enough away that you wouldn't know they were there unless you went looking. I'd highly recommend this as a getaway to unwind and relax. We greatly enjoyed our week-long stay at the Heritage Log Cabin in Hendersonville. The cabin was ideal and extremely comfortable. All that we could have asked for in an accommodation was available to us. The cabin was easily accessible from the major highways and close to both Asheville and Hendersonville. I would highly recommend this cabin on any families or couples that might be considering a comfy great-away in the mountains. CABIN LOCATION: Just a mile from I-26 exit 49A and Hwy 64 in Hendersonville, the Heritage Log Cabin sits on a fenced partial acre beside a small neighborhood of cabins and is less than a mile to a large shopping/restaurant complex including a Super Walmart. This convenient location is just a few minutes from downtown Historic Hendersonville Main Street shops, galleries and restaurants. It’s a quick 25 minutes to Asheville and the Biltmore Estate. Guests may purchase discounted tickets good for two full consecutive days with free wine tasting ticket for less than a one day gate pass! AREA ACTIVITIES: In WNC you'll find an eclectic group of people from movie stars to mountain folk. Our town & activities are as diverse as its residents. For outdoor enthusiasts there is hiking, mountain biking, canoeing, white water rafting, sightseeing, horseback riding, fishing, swimming, golf, miniature golf, rock climbing, snow skiing, zip line adventures & more! If you love to shop for the unusual, there are fantastic antique stores, galleries, boutique shops, and amazing local handcrafted goods. There are galleries, art/craft festivals, mountain music, dancing & fantastic restaurants! We're famous for the Biltmore Estate (the largest privately owned home in the US), the Blue Ridge Parkway lookouts & trails, Carl Sandburg's home, Thomas Wolfe's Home, Grove Park Inn & Spa, Blue Ridge Parkway, Chimney Rock, Mount Mitchell (highest mtn east of the Mississippi), Lake Lure, Maggie Valley, Hot Springs & more! Enjoy the Fun Depot for a wealth of indoor fun for kids.